The Villa Sabine community of townhomes sits directly on Little Sabine Bay and across the street from the Gulf. 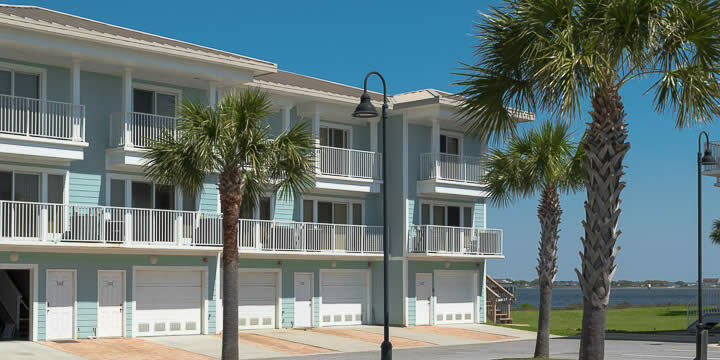 This location in Pensacola Beach gives the upper floors a splendid view of both, while a community dock on the Bay offers a way to enjoy a small boat. The townhomes were built in 2007 and 2008 to the latest hurricane codes. Aside from impact windows and doors, the walls are reinforced concrete and other wind-proof additions were included. The two-car garages have front and back entrances. You keep your cars in the front and have room in the back for a kayak, canoe, or small boat. Villa Sabine condos are townhouse style, with parking on the ground level, and living areas on the second and third floors. There are both two and three bedroom units, but all have 1,376 sq ft of space. Some owners choose to use the space for a third bedroom as an office or game room. Prices range from $350,000 to about $450,000 depending on layout and location. Some, but not all of the townhomes have private elevators as well. Upgrades in the homes are plentiful, from granite countertops and fine tile flooring to balconies on all the bedrooms. Another reason to consider them is the past potential for a large rental income. If you are looking for an investment condo, this could be a good one. Villa Sabine is one of the most popular townhome communities in Pensacola, and units are not often for sale. If you think this might be your perfect vacation home, you may need to get on a list to be notified when one is listed. 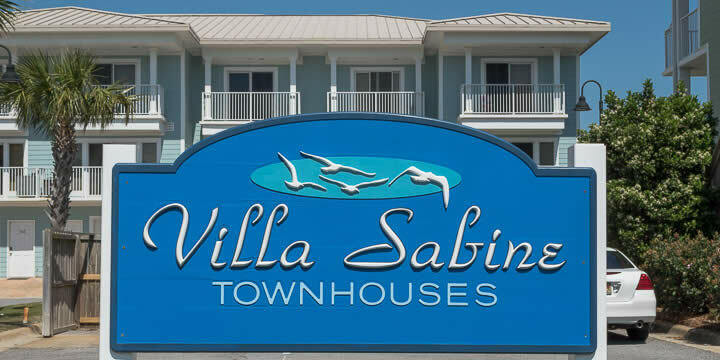 Call us for more information and to let us know of your interest in the townhomes at Villa Sabine, 850-437-5618.